As you may have gathered, I spent last weekend on the beach in San Diego with the lovely ladies Julia, Holly, Biddy and Briya. Julia wrote a couple of excellent posts regarding same. Posts have been written about this trip of magic by Jules, here and here. And she about covered mostly things, I think. Also I recognize that I said I would vlog this but I chickened out at the last minute because you don't REALLY want to see/hear me talk. And I don't REALLY want you to examine me for odd tics. AND. I recognize this story would probably make more sense with me explaining it with real-live words that TALK that you can HEAR, but you'll just have to bear with the written version. So! Saturday! We're all hungover and drunk and stuff and I'm looking at my feet like MAH GOD I NEED A PEDICURE and Julia is like ME TOO LET'S GET PEDIS THIS IS A GOOD IDEA. So we walk down the street aways on the theory that we are in Touristy Touristville Full of Tourism and there will be a nail salon thusly soon. First one we hit has a lone lady in there who simply cannot help us, what with the lunar new year upcoming, etc. 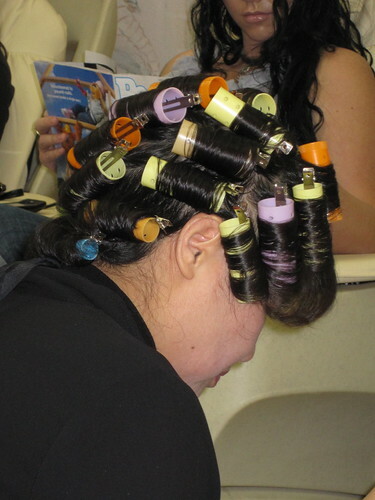 I would like to note that her services menu included the following: Virgin Tin Ladies, Virgin Tin Gentlemen, ROLLA SET. I tried googling Virgin Tin Ladies/Gentlemen, but I only get Julia and I referencing THIS THAT JUST HAPPENED. 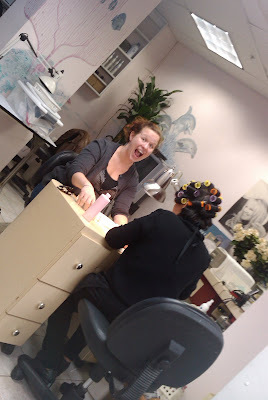 Okay, so, this lady, as pictured above, is like, HEY LET'S DO YOUR NAILS NOW, and I'm like um...I don't wanna? But it turned out to be easier to just get the nails painted than to argue. So there's some dolphins leaping out of the wall and this lady, while she's painting my nails, is telling Biddy, "I give you Brazilian back room real quick professional" and Biddy's saying, "I think I'm good thanks!" 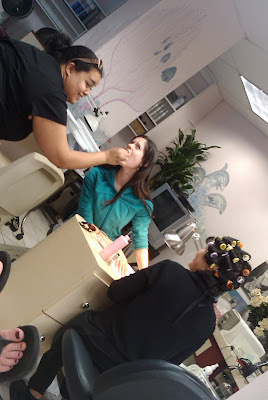 Then she strong-armed Jules into gettin' her nails did via same methods, and tried to then boss her into an eyebrow wax. Biddy fed Julia her birth control, cuz that's what friends are for. And then I'm sitting there and this lady tells me, "I wax your eyebrow real quick, real professional." "I don't wax my eyebrows." "You don't wax your eyebrow? You look like retarded kid. You look like Downs Syndrome." (Looking around at other girls for agreement) "Am I right? You don't wax your eyebrow, it looks Downs Syndrome kid, it makes you look retarded." I could get into all kinds of things about this little monologue, but I'm only going to focus on one aspect: I HAVE NO EYEBROWS TO WAX. I HAVE LIKE SEVEN EYEBROW HAIRS, WHICH I MUST AUGMENT DAILY WITH PENCIL. My eyebrows start like, halfway over my eye, where they gather for like, 10 consecutive hairs, and then peter out again before they get to the end. I'm afraid to tweeze the damn things, don't even get me started on waxing. 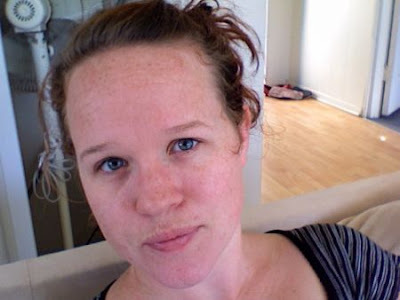 Here's a post where I talk specifically about my lack of eyebrows.